There is a very important football tournament taking place in London next week. This is the CONIFA (www.conifa.org) tournament which is held every two years. There are 2 Armenian members of CONIFA – Arsthak and Western Armenia. The team of Western Armenia has qualified for the finals of the tournament in London. Their first match is on May 31st in Carshalton, second is on June 2nd in Slough and the third is on Sunday June 3rd in Enfield. 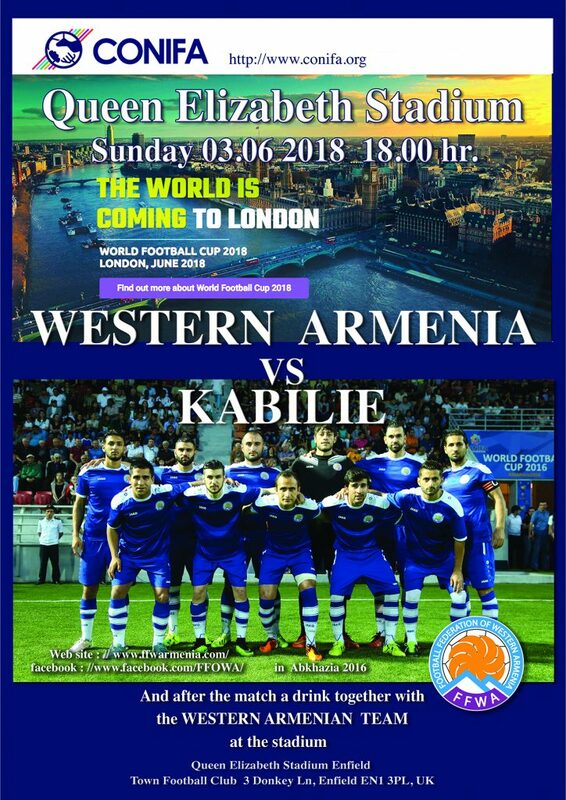 The Armenian Team Organisers would like to gather as many London Armenians as possible to support the team at their games and on Sunday in Enfield, after the game, have the opportunity to meet the team in the Enfield Football Clubhouse. To read more about the CONIFA WORLD CUP, PLEASE CLICK HERE.